Important: If using our "Custom Facebook Feed" plugin then you don't need to follow these directions unless you want to display events. 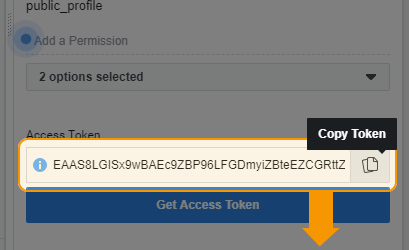 Instead, you can use the easy "Log in and get my Access Token" button inside the plugin to get your own Access Token. If you want to display events from your Facebook page then you will need to follow the directions below to retrieve a token. 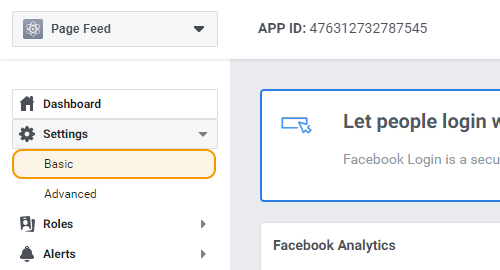 1) Go to developers.facebook.com and click on Log In in the top right. Log in using your personal Facebook account. Note: You must use the username and password from your personal Facebook profile. 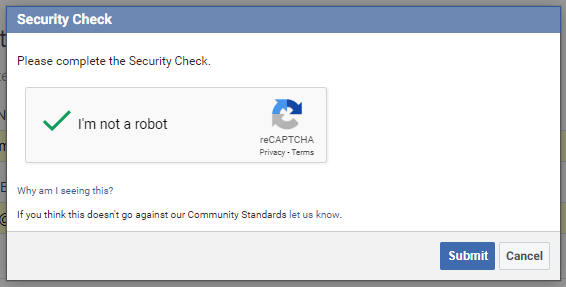 Facebook doesn’t allow businesses to register as developers, only individuals. 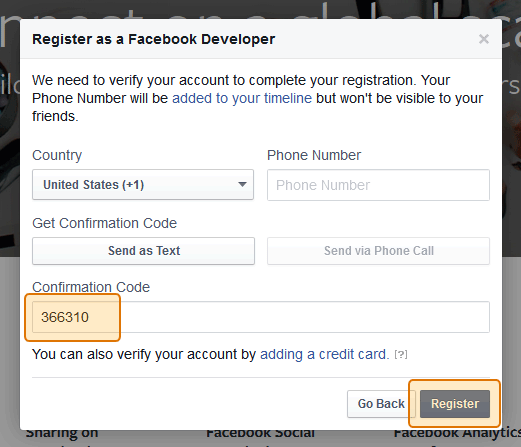 2) If this is your first time signing in to the Facebook Developer portal then click on Register. Registering is a quick an easy process which will take less than a couple of minutes. If you’re already registered then you can skip ahead to step 7. 3) Accept the Facebook terms and click Next. 5) Facebook will send you an automated text message containing a confirmation code. Enter it in the box and click Register. 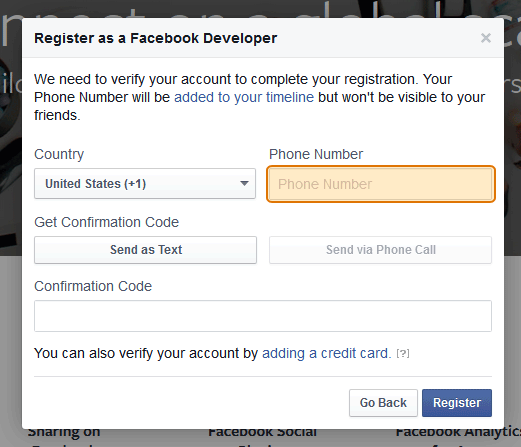 6) You’re now registered as a Facebook Developer. Click Done. 7) Hover over My Apps and then click on Add New App. 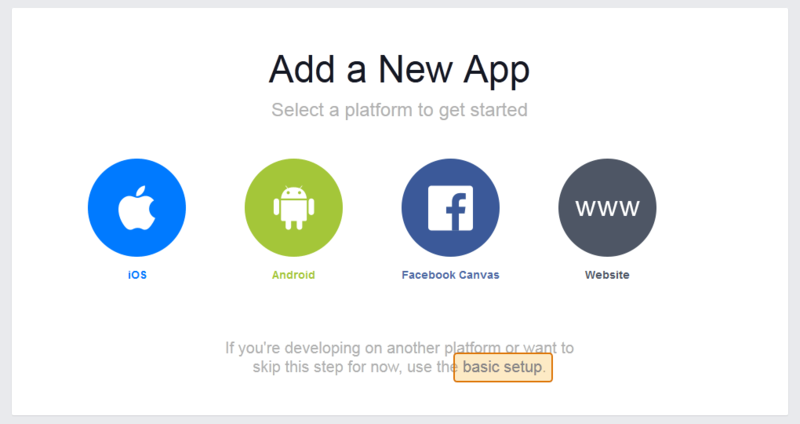 8) If prompted, click on basic setup. Note, this isn’t always displayed so, if not, then you can skip to the next step. 10) Complete the Security Check and click Submit to complete the app setup. 11) Important: Make sure your app is in “Development mode” and not Live. Then, go to the Settings > Basic to get your app information. 12) Important: Copy and paste your App ID and App Secret (shown below) into the fields in the next step. Note: Make sure to click “Show” next to your App Secret before copying. 13) Copy and paste your App ID and App Secret from step 12 above into the fields below, then proceed to the next step. 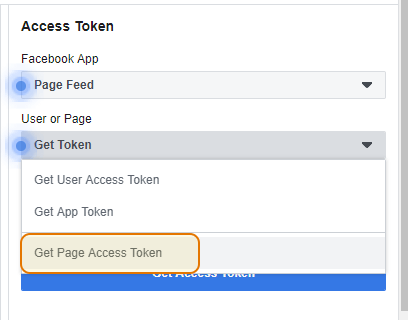 15) Open the dropdown labeled User or Page button and in the Page Access Tokens section select the Facebook page you want a token for. 16) Click Get Access Token. 17) This provides a temporary (1 hour) Access Token. Copy this temporary Access Token and paste it into the field in the next step to extend it for 60 days. 18) Paste your Access Token from step 17 into the field below and click Extend my token. 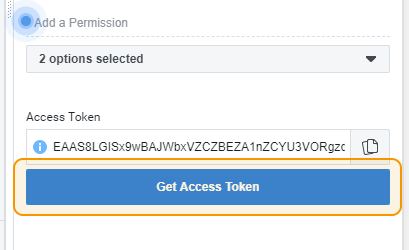 19) Copy and Paste this token into the field labeled "Facebook Access Token" on the plugin's Settings page. You can also use it in a shortcode by using the accesstoken shortcode setting. Important: This token can only be used to display content from the Facebook page you selected in step 15. That the app is in "Development" mode and not "Live"